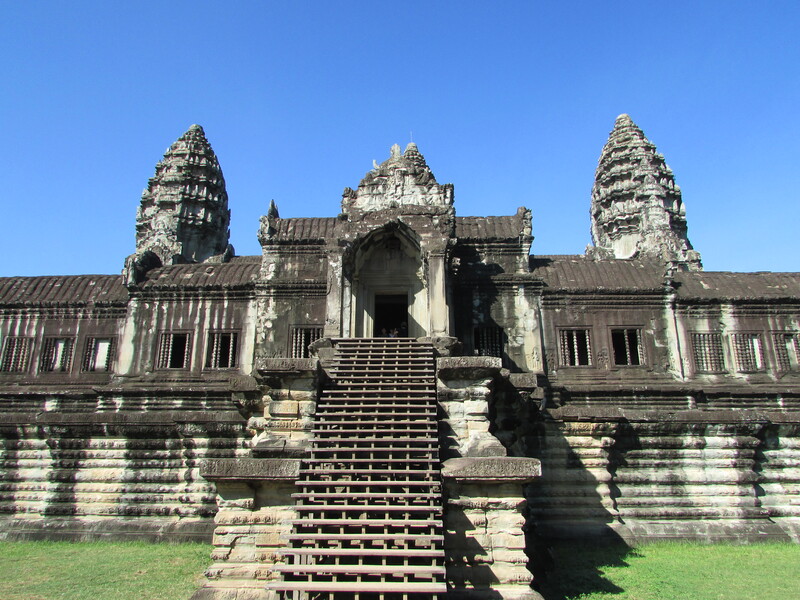 Living the “high life” in Cambodia… | "MASTERS"
Posted on November 30, 2015 by Mark and Sarah - MASTERS! MARK: What sort of house do you live in? A mini mansion, a four bedroom box, a two up two down or perhaps an end of terrace? All very nice. 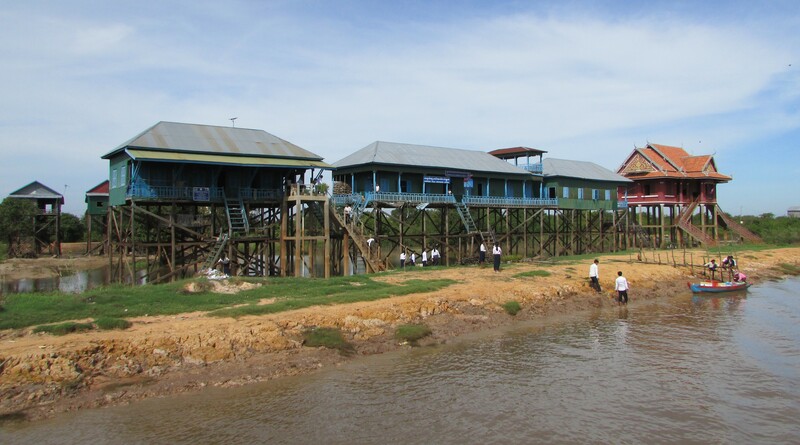 But would you be in the market for a house built on tall wooden stilts? Throw into the mix the fact that for half the year you come out of your front door and walk 10 metres down rickety steps to a mud road, with the village below. And for the other six months, you literally step out of the door and on to your boat should you need to go to school, pop down to the local “shop” or go and see the mother-in-law. 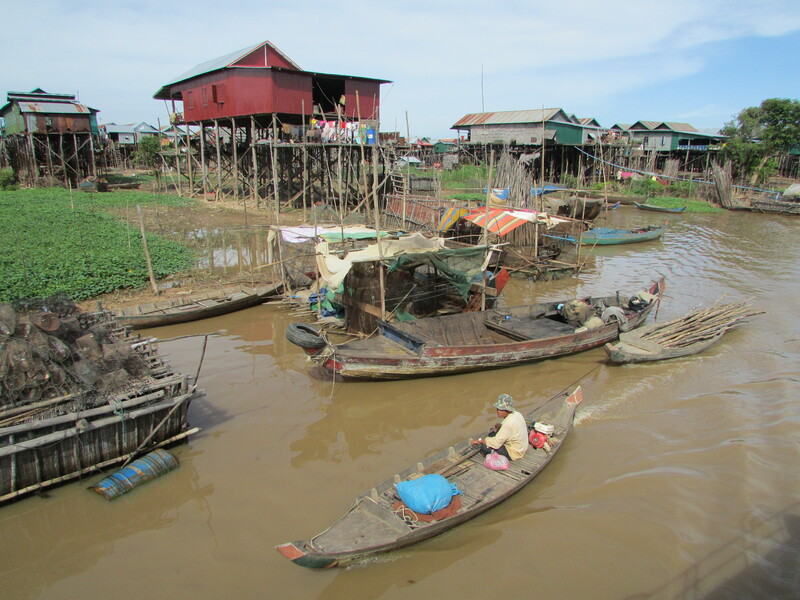 Welcome to the town of Kampong Phlouk in western Cambodia, which literally sits in South East Asia’s largest freshwater lake, Tonle Sap. I thought I’d seen most things on our month long trip around Indo-China. But oh, no! Nothing like this! What a truly fascinating, random place. 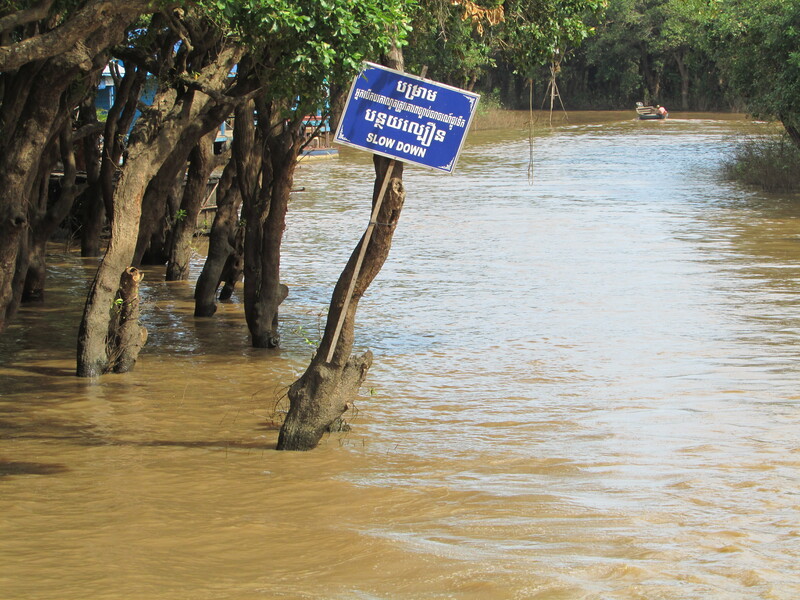 According to Wikipedia and I quote: “The Tonle Sap Lake occupies a geological depression of the vast alluvial floodplain in the Lower Mekong Basin, which had been induced by the collision of the Indian Plate with the Eurasian Plate. 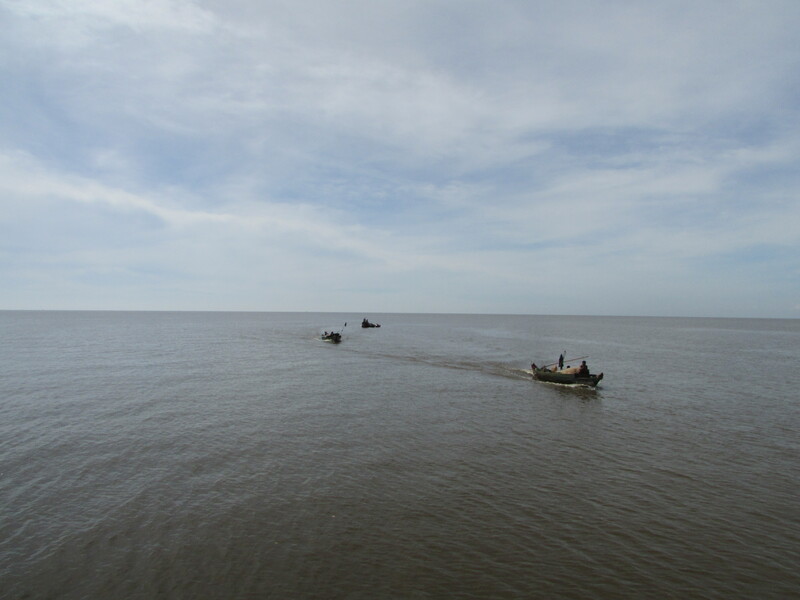 The lake’s size, length and water volume varies considerably over the course of a year from an area of around 2,500 km2 (965 sq mi) and a length of 160 km (99 mi) at the end of the dry season in late April to an area of up to 16,000 km2 (6,178 sq mi) and a length of 250 km (160 mi) at the peak of the South-West monsoon’s precipitation culminate in September and early October”. However there has been nowhere near the normal level of rain this year – the locals blaming climate change…. SOMETHING FOR THE WORLD LEADERS IN PARIS TO CONSIDER! 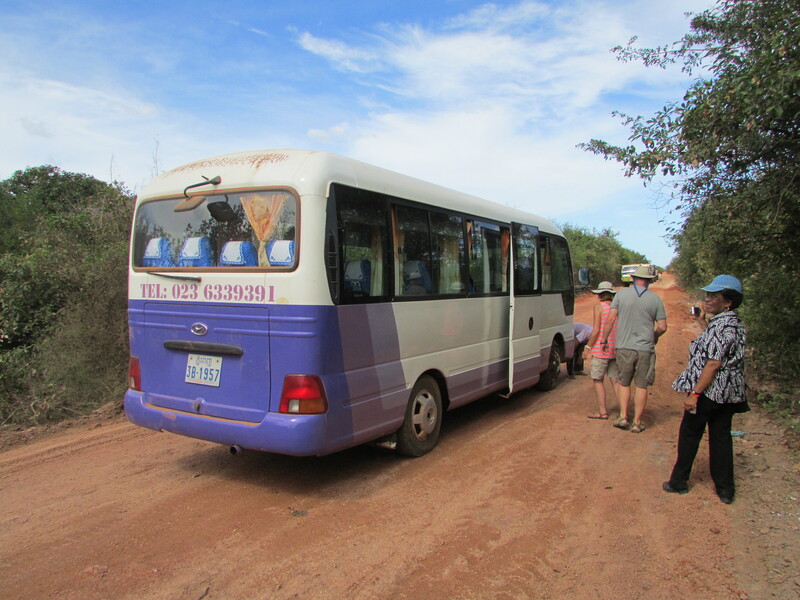 To get there, we initially travelled by small bus – more about that bus later! An hour out of Siem Reap (home of the world famous Angkor Wat) we travelled through lush countryside before racing across very flat land, paddy fields everywhere. Soon rice gave way to mango swamps. Knarled trees and bushes rose snake-like from dark brown water on either side of our raised dirt track just a few feet above the water’s edge. 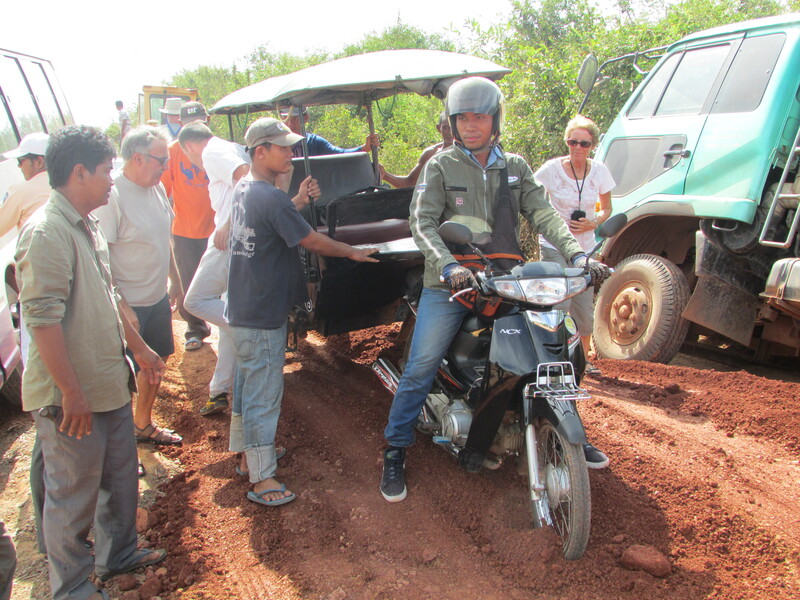 We bounced along, leaving a cloud of choking dust enveloping a poor motorbike behind us. 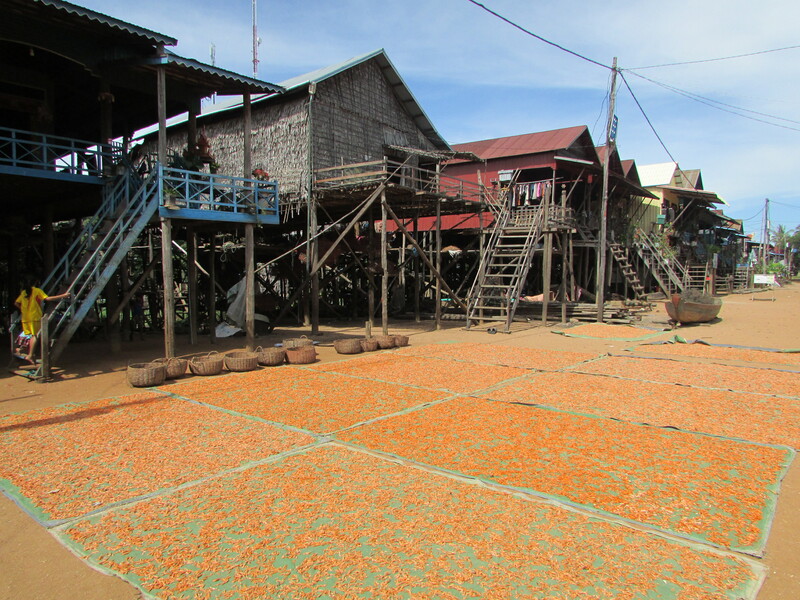 The road then abruptly stopped, replaced by a makeshift temporary quay with around fifty brightly coloured wooden boats all bobbing up and down. Highway became waterway. All change please! 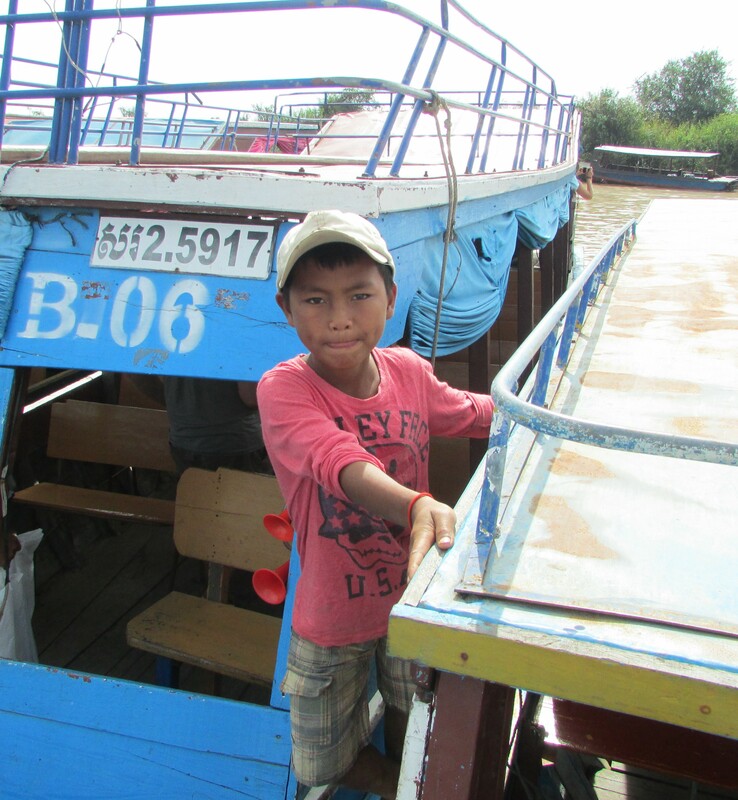 Our unnamed boat, was built for about 20 people, wooden bench seats on both sides. Pushed off from the bankside by a young boy aged about 8, we headed south along the river, electing to climb on the roof to get a panoramic view of the quickly changing landscape. Casting off – he later gave Sarah a neck massage for $1 – smart boy! Round the next right-hand bend we saw our first building on stilts. 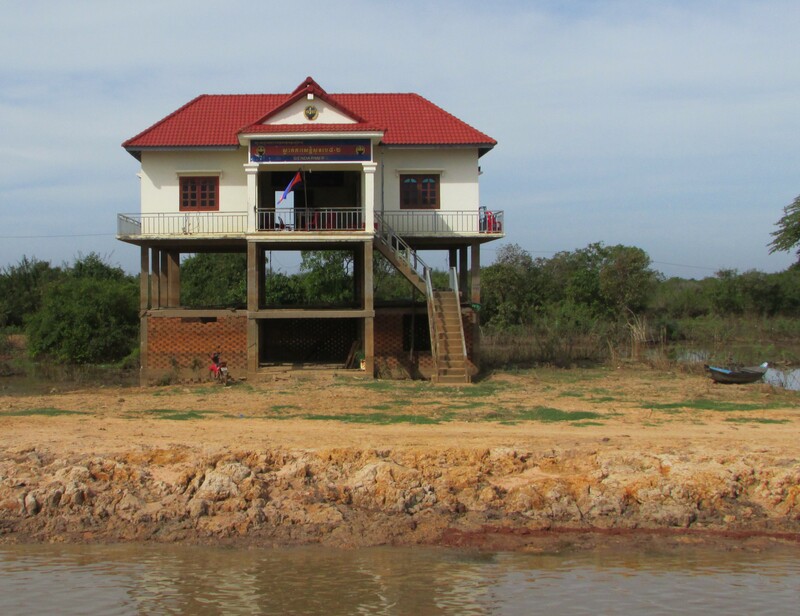 A “Gendamerie” – here, the local “cop shop”, 30 feet in the air. Bizarre! Around the next left bend it wasn’t the site, but the awful stench of rotting fish that assaulted our senses. The source close by as two women emptied their nets of recently caught small wriggling fish into wicker baskets ready for manufacturing fish paste – a local speciality. 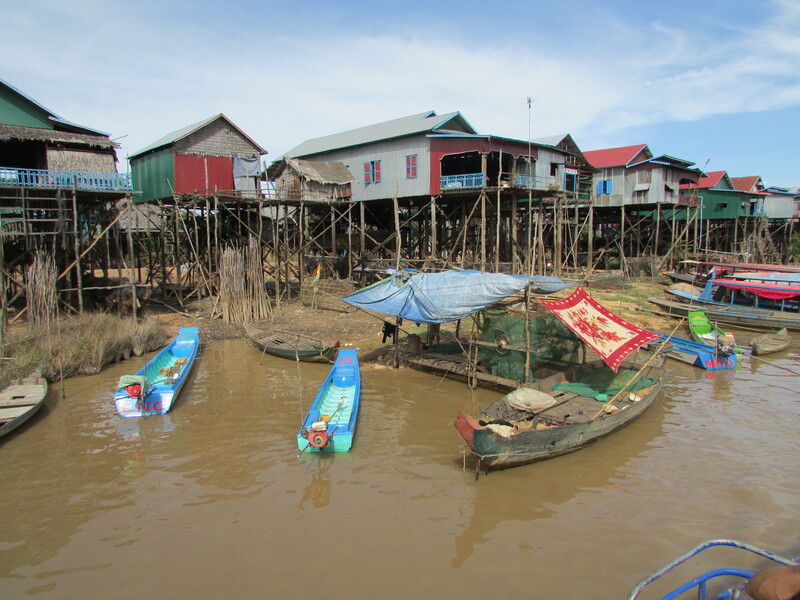 We were now in the outskirts of Kampong Plouk as the river widened a little more to reveal stilt city. On both sides, were ramshackle houses with corrugated roofs perched precariously on large wooden logs and beams. Staircases ran down to the bottom level, where pigs grunted, chickens scratched around for seed and young children with very little on played hide and seek on the impacted mud and silt. 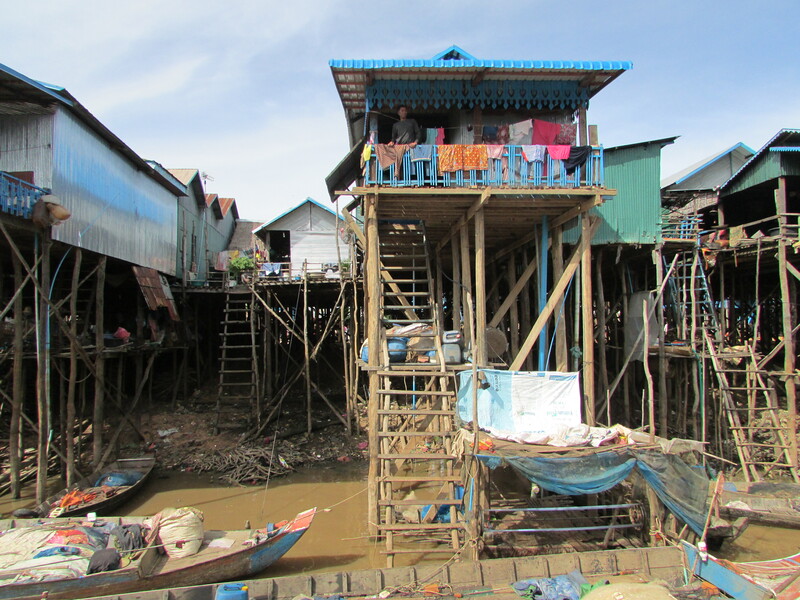 Stilt houses were everywhere, now running alongside the water/river just like a “normal street”. And it wasn’t just houses. There was the local primary school high in the sky, the Catholic Church, Buddhist Monastery and food shop. You WOOD NOT believe it. 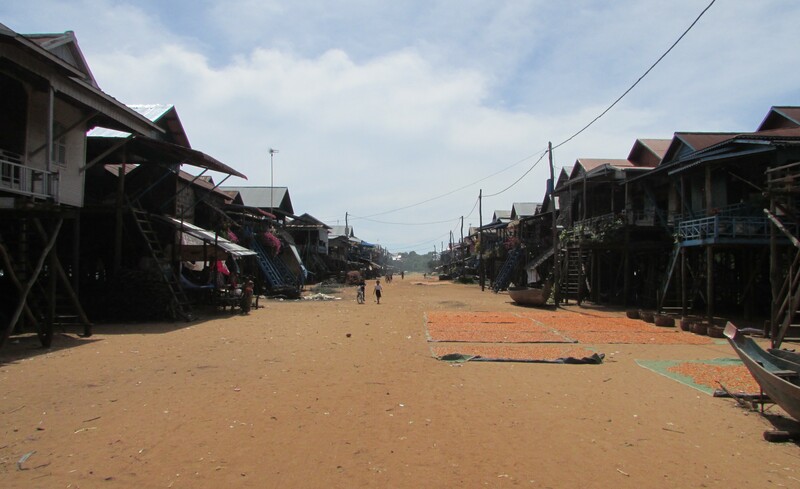 A town of 2000 people ingeniously living out of harms way. CHECK OUT OUR GUIDE, CHAMS’ VIDEO BY CLICKING ON THE BELOW LINK AND SEE IF YOU CAN SPOT SARAH! After about ten minutes, the houses and work places began to thin out, replaced with deep jungle and mango swamps. The feeling of isolation grew, just the sound of the old diesel engine and an occasional bright green parrot screeching over-head, with interesting river signs pinned to trees. But where was the lake? The answer soon became clear as a shimmering mass of water glistened a few hundred metres down-stream. We’d made it to the edge of the lake proper. 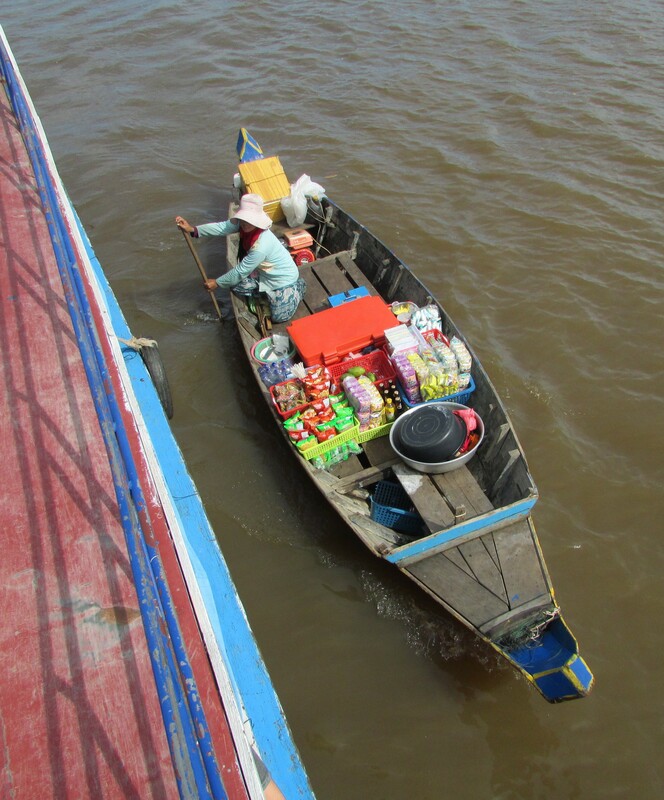 Nothing now to see, just the horizon and a local fishing boat being visited by a mobile 7/11 mini-mart, another small boat, another enterprising young business lady. Beautiful – next land, 100 miles away! Our boats engines were cut. We drifted. No sound, just that of lapping water. It was beautiful. The sun high and very hot. But I was keen to explore on foot the town as I could not get my head around the fact that the main “High Street” which was presently 15m wide, had a few weeks before been under 10 metres of water. My wish was soon granted as we headed back, chill time over. 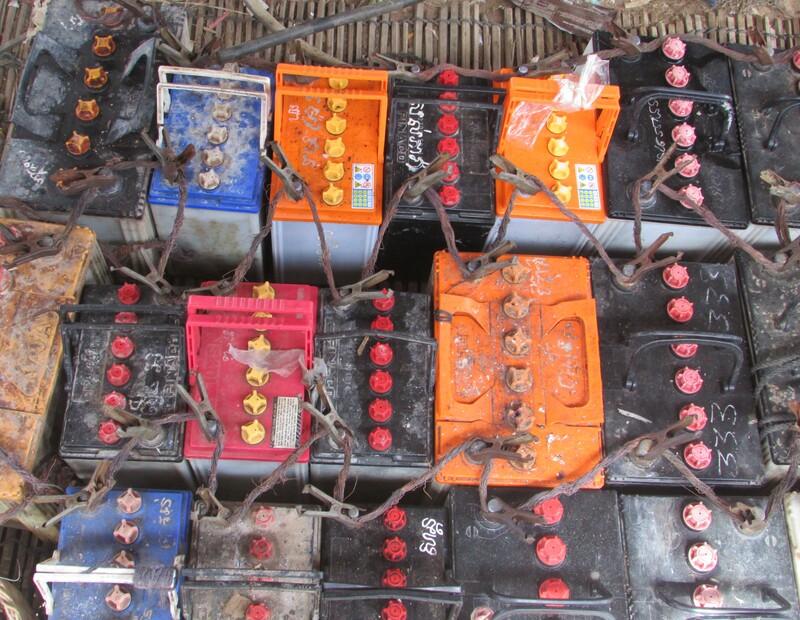 Walking on two four inch wide planks, we disembarked and immediately discovered a bank of car batteries underneath a wooden house. So this is how they lit their houses. This should be 10 metres under water…. Back on the bus, time to relax – er no! Just a couple of miles after boarding from the quay, we slowed down and stopped behind another bus. The reason soon apparent. 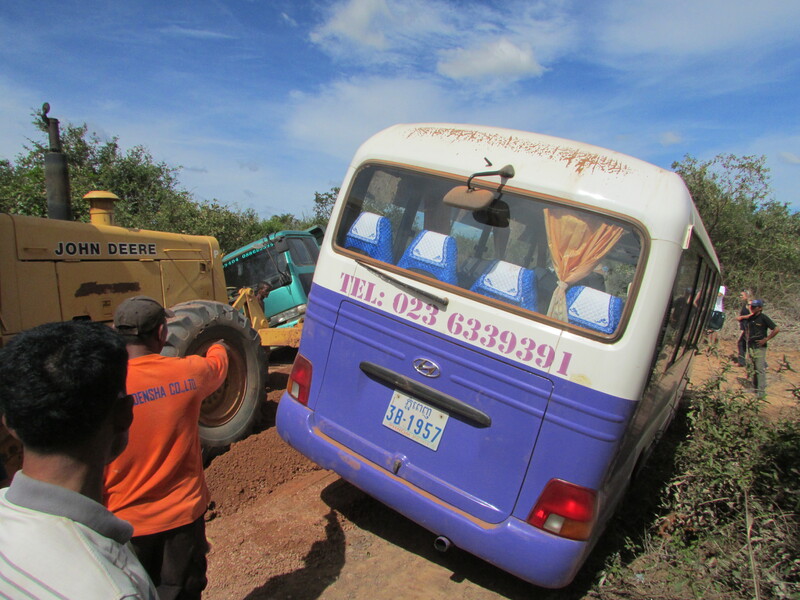 We were driving on a compacted mud road, which along this stretch was being widened by additional soil. 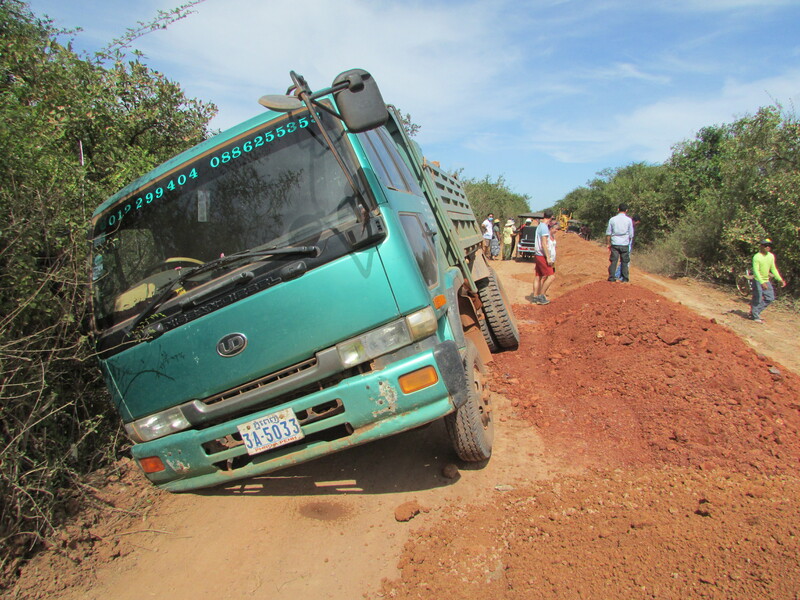 In the centre of the road was freshly tipped soil. 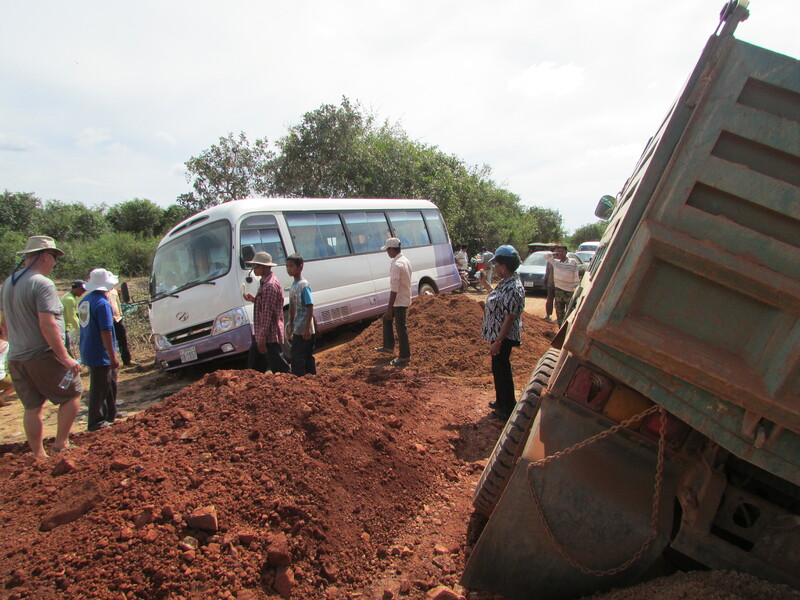 To our left, a local lorry which had sunk in to the mango swamp and was now leaning at close to 45 degrees. 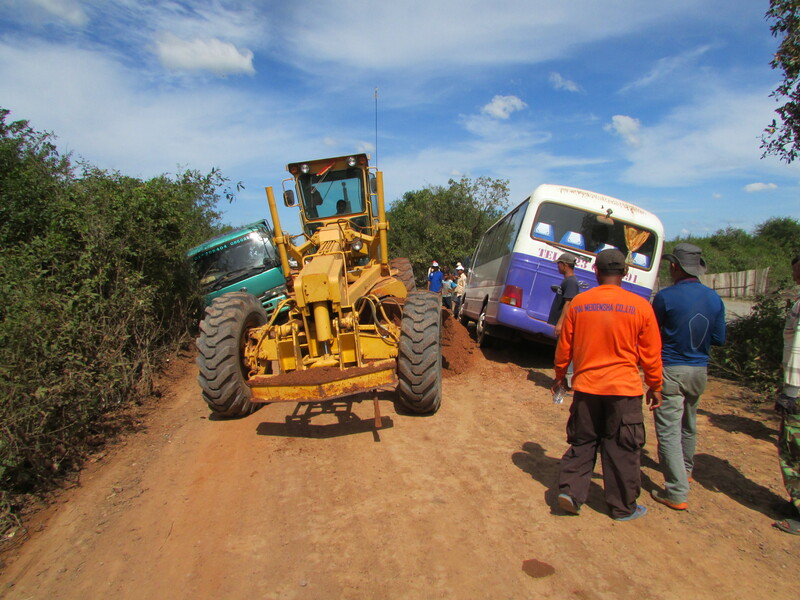 The road was blocked and remained so for about an hour, until a big yellow “digger/scraper thing” arrived managing to clear part of the road. The bus in front made it through and sped off. 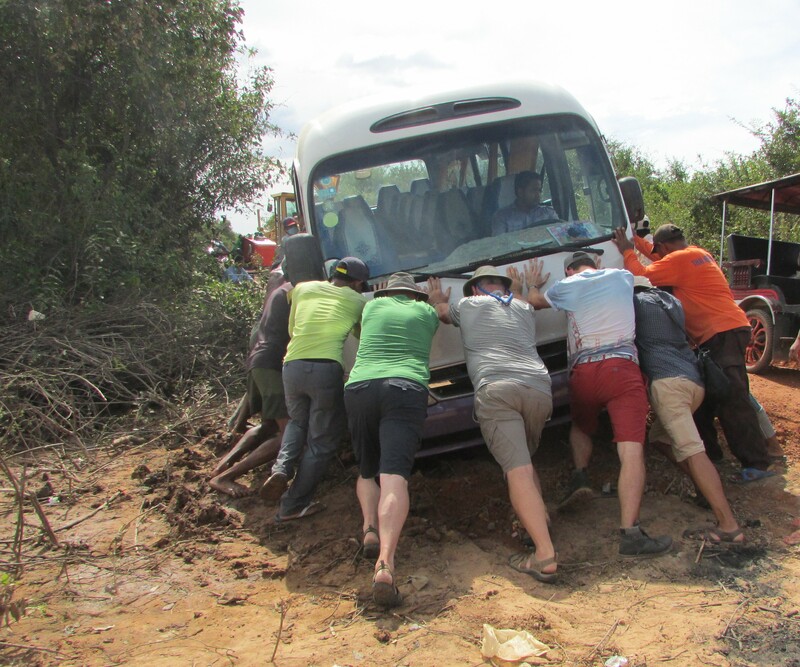 Our bus approached, did not quite get the line right and promptly began sinking/leaning at 35 degrees, the front right wheel caked deep in mud, stuck down to the axel. We tried pushing. That didn’t work. Somebody found a spade and started to dig. That didn’t work! So time to find some chains, which in another 30 minutes arrived. Half an hour later, we were off. In England, a major drama me thinks. Here, it was just another typical day. I like that. Sequence of events below. So we are now in Bangok. I write this blog from a boring little room, looking out of the window to a concrete wall ten feet away. The high life long since gone. Our four week tour is now over. A fantastic time, so many experiences. 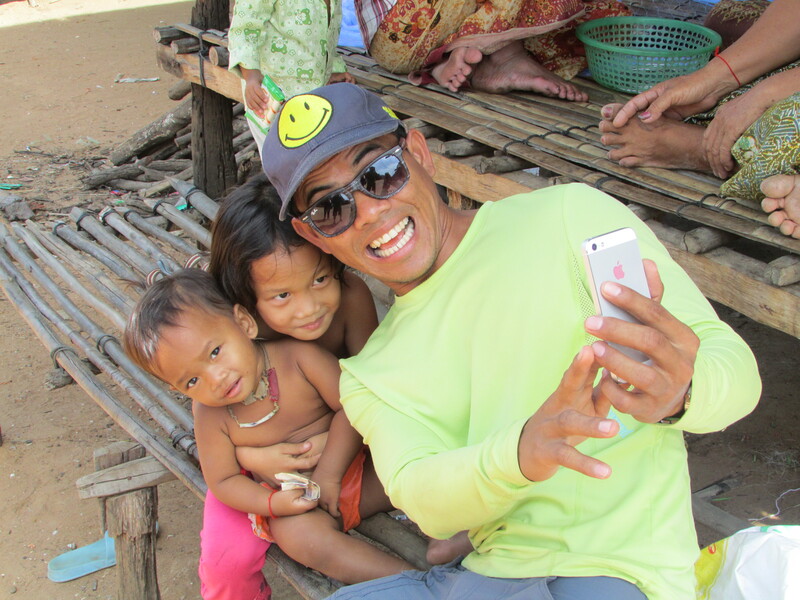 We were fortunate to have a superb young guide called Cham who is loved by children everywhere he goes. Thailand, Laos, Vietnam and Cambodia. 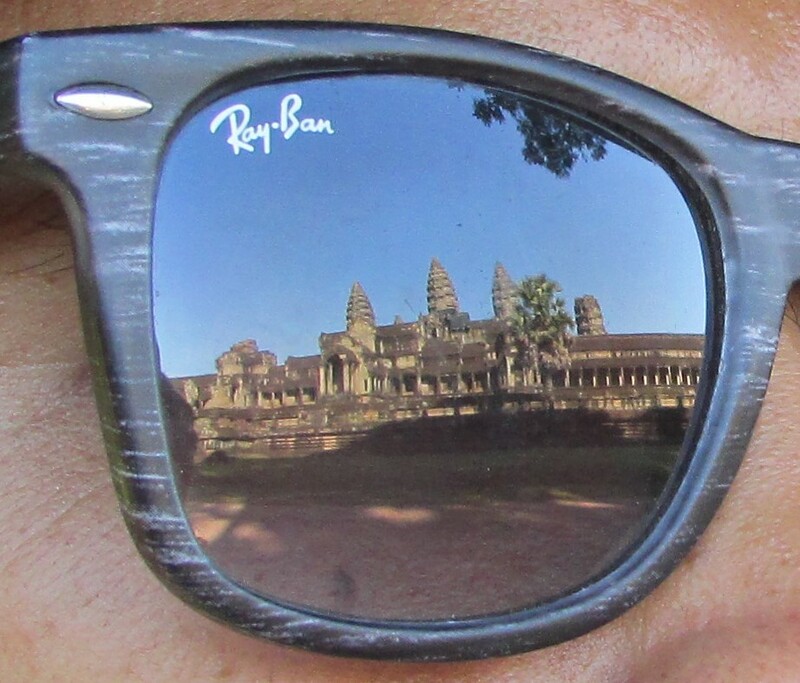 Four fascinating countries, but if I was to pick one it would be Cambodia. Why? Superb scenery, amazing historical sites and even better people. A country that was nearly wiped out a decade ago, now re-building. Please do consider going in the future – it deserves all of our support. Now for some chill time. After 13 weeks on the road, we are off for a break in southern Thailand and then Malaysia. With the conclusion of the Indochina portion of the trip, I thought I would leave a quick note to let you and Sarah know that a) it was an immense pleasure spending the first 14 days of your journey with the two of you, b) following the second half has left me both fascinated and a little envious of what you saw and experienced, and c) I wish you both the best of luck as you continue on your excursion. 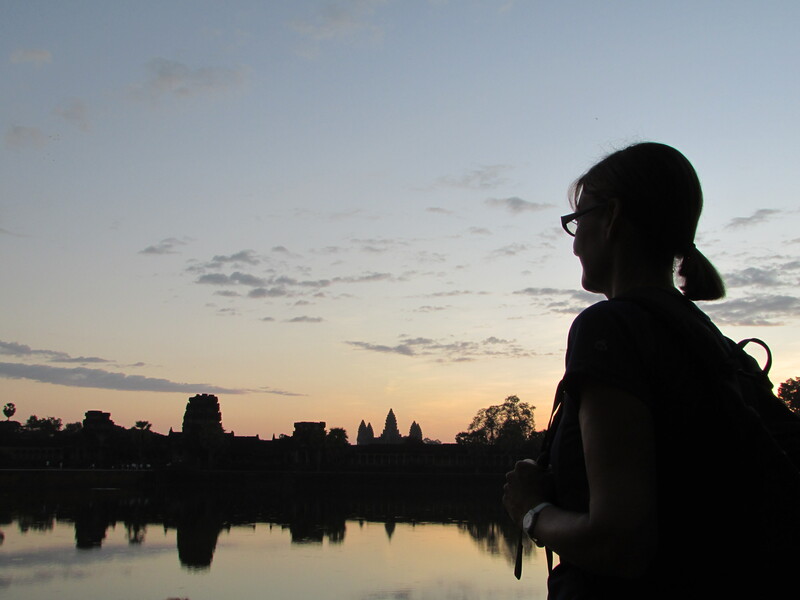 I’ll certainly be following through the blog, not only to see the world through a familiar lens but also to provide a bit of personal justification that long term travel can and should be done, regardless of what day of the week you sit in life. Brendan, Brendan Brendan. I was just talking “positively” about you yesterday and it is really good that you continue to read – thank you!!! The second two weeks were same same, but different, different and I would, if you get the chance, “complete the ring” to get the full social, geographical and historical perspective of this part of south east Asia. I am still on Friday night, but much richer for having met many people, including your goodself who inspire me to live until Monday night and beyond. Will do. And when you make it to Peru and want some tips on hiking the Inca Trail, feel free to reach out. As Strictly’s Craig would say: “Amazing”. Stunned by the fact that even the little ones could speak some English. No wonder we as a nation are lazy when it comes to learning something other than our mother tongue!